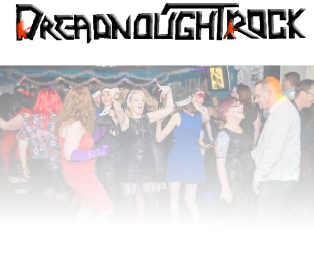 Since the early 70’s the mix of good rock music and good company have made for many a good night at the Dreadnought. The infancy of disco was adapted to play only Rock tracks round the back of the Hotel and the rest is history as they would say. From it’s early days in the function room at the Dreadnought Hotel it has slowly evolved over the decades with new audiences, new Rock tunes and new technology such as CD’s ? Many will have their favourite times at the Old Hotel, no doubt about that but due to factors out with everyone’s control in 2006 few options were left for the Rock Crew when Swallow Hotels went into administration taking the legendary Rock Club with it….well nearly. After many long negotiations during the administration period with the hotel we faced the prospect of it all coming to an end. After a lot, and we mean a lot of thought with absolutely no prospect of getting the Hotel back open we reluctantly moved down the road a bit to the bar zero section of the Ratt, and for many it was sacrilege - it could never be the same. Over the coming months many new people decided to come and see what the Dreadnought was all about and felt the new surroundings better in some ways, the same as many returning regulars never felt settled in the new surroundings. However turnouts doubled from the Hotel days and had many a night where the Q’s were long with the club packed to a new audience, some experiencing the mix of Rock for the first time that had made the Dreadnought what it was and started to reshape it’s future as just in life things move on, adapt and evolve. The honeymoon didn’t last too long at the ratt and were forced to relocate once more. So we packed our bags and moved closer to our old home to what was the old commercial to many or EH48 1AX in 2007. Initially we took up residence in the upper level but plans were soon underway to make this our new and permanent home over two levels. Slowly but surely the two levels were joined internally to offer a lounge feel downstairs with the Rock Club firing out the tunes upstairs with out having to leave. The regulars started to return to what would be our new home, with many still harking back to the Hotel days but like it or not was never realistically coming back. Due to demand there was an introduction of live music on Friday ahead of the Rock Club getting busy which soon caught on featuring some great local live acts with one of our rock jocks still warming you up nicely on a Saturday ahead of the full on experience upstairs. Despite some fine tunes and a lot of hard work the Saturday Early Rock sessions made way to more live music as audience figures tailed off in the early part of the night as the recession started to bite. The partnership of an early gig ahead of the prime time for Nightclub goers continues to roll on in a unique club that will be hard to find elsewhere in the UK which is right on your doorstep where it always has been for the last forty odd years. We continue to gain new regulars with special live shows featuring an ever expanding list of local, national and international musicians that allows the experience of the Rock Club after each event too. Hopefully with continued support, hard work from the Rock Crew and you guys we might hit 50 years, which isn’t that far away to become not just the longest running rock club in Scotland but possibly in the world.